17 Jun – Photos uploaded. 16 Jun – Team S’pore results. 16 Jun – Shanti Veronica Pereira eyebrow-raising performance at Asian Junior. 16 Jun – Jannah Wong hurdles her way into the 100m hurdles women record history books. 13 Jun – Shanti Veronica Pereira grabs bronze at the Asian Junior. 13 Jun – Zubin Percy rewrites 40-year-old long standing 400m national record. 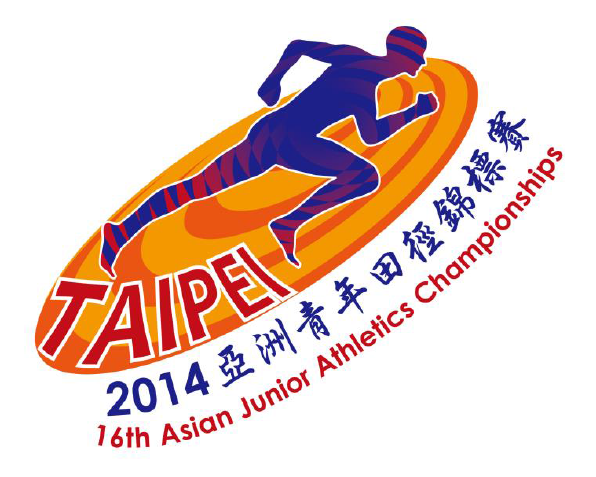 12 Jun – 12 Singapore athletes to compete at Asian Junior C’ships 2014. 2 Jun – LIVE streaming. 13 Mar – Page updated with maps, new dates, schedule, etc.. Athletes aged 18 or 19 years on 31 December 2014 (born in 1995 or 1996), may compete in any event. Athletes aged 16 or 17 years on 31 December 2014 (born in 1997 or 1998), may compete in any event. However, the maximum number of events in which a Youth athlete can compete is two individual events plus one of the relays. If the two individual events are Track Events, only one of these may be longer than 200m. No athlete younger than 16 years of age on 31 December 2014 (born in 1999 or later) may be entered. End of April – End of qualifying window for SAA sanctioned meets, see below. a. 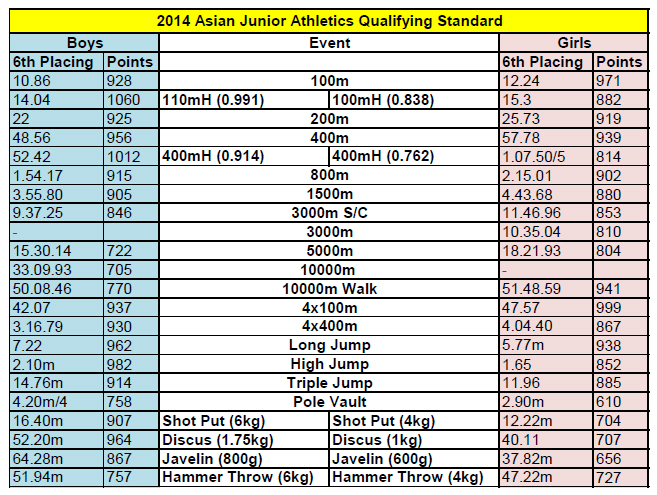 6th placing of Asian Jrs 2012 (See below qualifying mark table below). b. SAA is willing to send any Singaporean Athlete who meets the qualifying mark. If no Athlete or less than 8 Athletes meet the marks, SAA is willing to send a maximum of 8 athletes who are closest to the qualifying mark based on the percentage each one is from the qualifying mark’s IAAF points. Athlete runs 10.89; This is worth 919 points and is 1% off the QT. d. All SAA sanctioned competition results below will be considered for nomination. Missing in the above is Decathlon and Heptathlon events which will be contested at Asian Junior. Asian Junior (Taiwan) Pole vault men 4.20m 4.38m Huan, Jun Kai, Dylan SSP 17 Nantou Int.